It’s rare for a cookbook recipe to tell you up front “this is really hard to make,” that’s not how you sell more cookbooks. It’s even rarer for a cookbook author to scrawl “This recipe doesn’t work” across his own book, but that’s exactly what Peter Meehan did when I presented him a copy of Momofuku to autograph. I wanted to make this dessert as the last course in the Valentine’s Day meal I cooked for She Who Must Be Obeyed that included the brick chicken, and oysters with kimchi consommé. 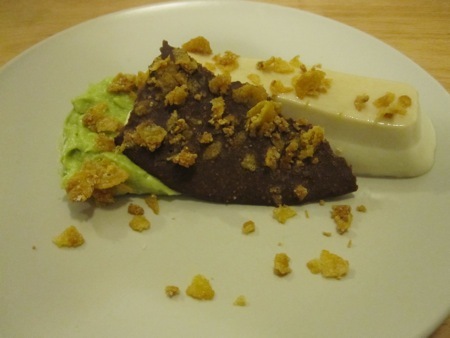 It looked easy but time-consuming: a panna cotta with three garnishes (chocolate-hazelnut thing, avocado purée, caramelized cornflakes) and a sub-recipe (praline paste) . I had a few days lead time, I had all of the ingredients, there was no difficult technique involved, but I was still filled with dread: This recipe doesn’t work. I read through the recipe looking for obvious errors but couldn’t find any. There was nothing left to do but barge on ahead. I began by making the base for the chocolate hazelnut thing. (Yes, it’s called a “thing” in the book.) 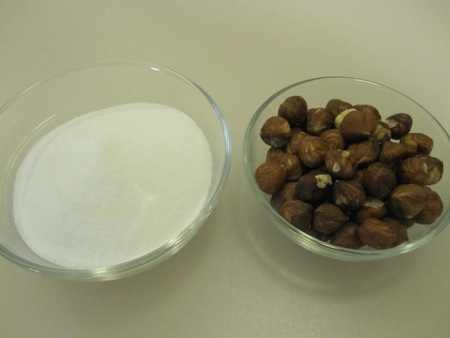 I weighed out 70 grams of hazelnuts and 100 grams of sugar. I toasted the hazelnuts in a 400°F oven for 15 minutes, let them cool, then used a kitchen towel to rub off the skins (a trick I learned from Julia Child). 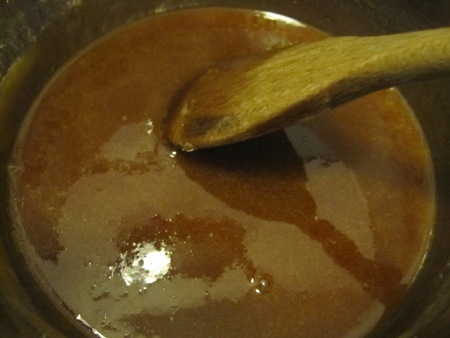 While I worked on the nuts, I added the sugar to a small saucepan and set it over medium-low heat, stirring occasionally until I had a dark caramel. 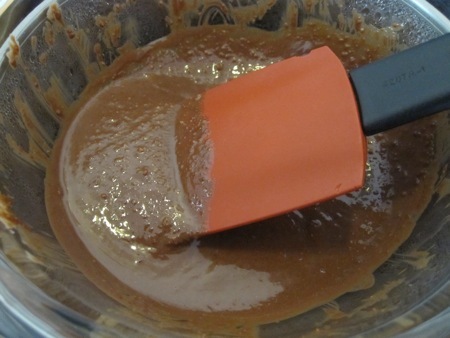 I put the hazelnuts in a blender, added the caramel and a pinch of salt, and ground up the mixture until a “smooth paste” formed. That didn’t happen. Either the nuts were too dry, or the caramel was too thick, but I had to add a small splash of vegetable oil to bring the components together. I wound up with a coarse paste, which would have to do. 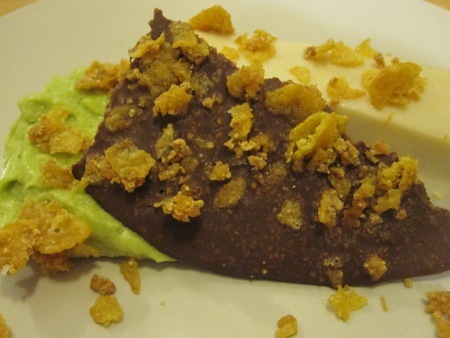 The cornflakes are incorporated in to the chocolate thing as well as sprinkled over the final plating. 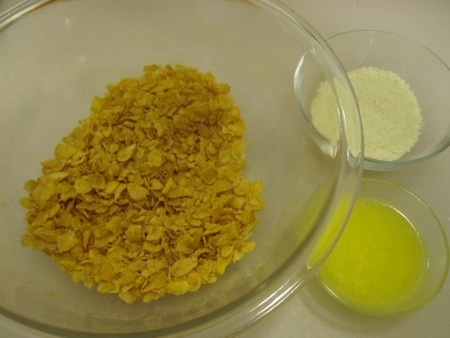 I started with 60 grams of cornflakes which I crushed into crumbles, 45 grams of melted butter, and a mixture of 12 grams of nonfat dry milk powder, 12 grams of sugar, and a gram of kosher salt. I added the butter to the flakes, sprinkled the milk/sugar mixture over them, and tossed them with a spatula until they were evenly coated. 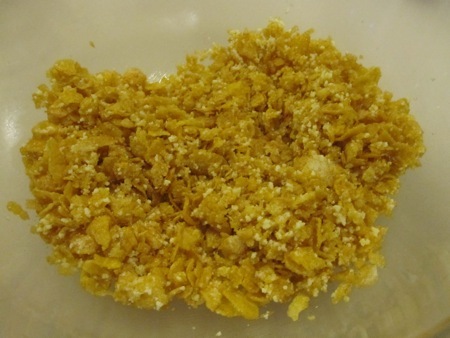 I toasted the mixture in a 275°F oven for about 20 minutes, until the flakes turned golden. I let them cool, then stored them in an airtight plastic container until needed. 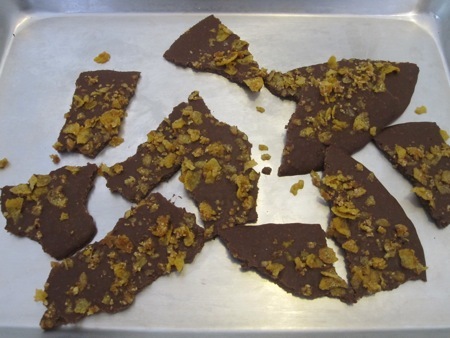 To make the second garnish I measured out two tablespoons of the caramelized cornflakes, 55 grams of the praline paste, 55 grams of gianduja (hazelnut milk chocolate), and 10 grams of 70% bittersweet chocolate. 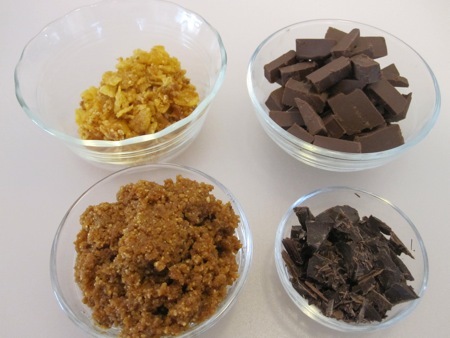 I placed the chocolates and praline paste into a glass bowl and mixed in a quarter teaspoon of canola oil, a half teaspoon of corn syrup, and a pinch of kosher salt. I set the bowl over a pan of simmering water and stirred until the mixture was smooth. 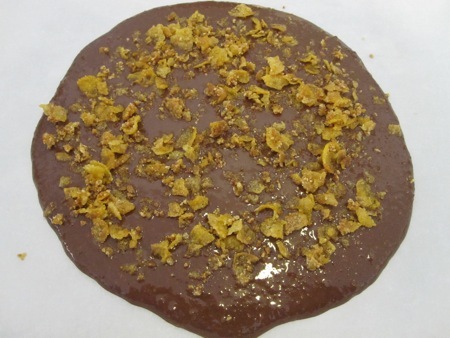 I poured the melted chocolate onto a Silpat-lined baking sheet, spread it until it was a quarter of an inch thick, then sprinkled the cornflakes over the top. I put the chocolate in the freezer to set, then broke it into random pieces which I kept in a container in the freezer. 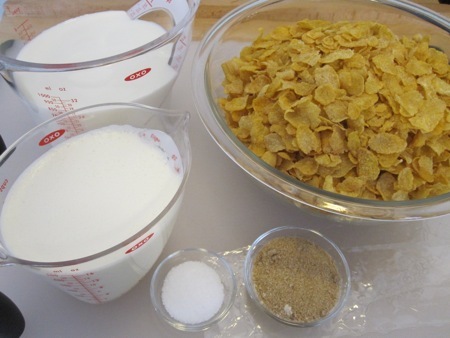 It was finally time to move on to the main act and another collection of ingredients: 265 grams of cornflakes, 710 grams of whole milk, 470 grams of heavy cream, 30 grams of light brown sugar, 2 grams of kosher salt, and 4 grams of gelatin. Why measure everything in grams? If there’s a possibility of failure, it’s best to use weight instead of volume for your measurements. 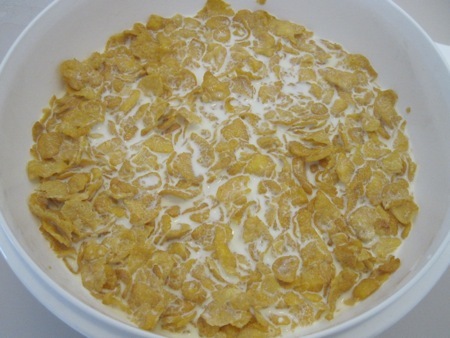 I toasted the cereal in a 300°F oven for twelve minutes, then combined it with the milk and cream to make a very big bowl of soggy cornflakes. After steeping for 45 minutes, I passed the soggy blob through a fine-mesh strainer, pushing down with a spatula to extract as much liquid as possible. When I was done I had a cup and three quarters of milk/cream, which I increased to 2 cups by adding some additional heavy cream. 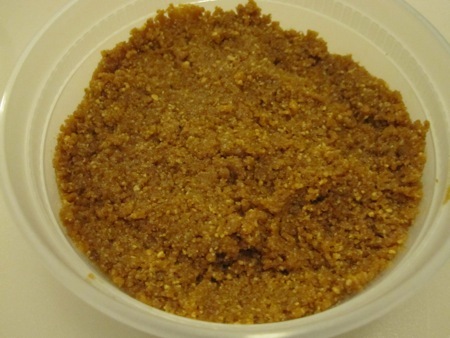 I added the brown sugar to the mixture and warmed it in a microwave. While it warmed, I bloomed the gelatin sheets in two cups of cold water. 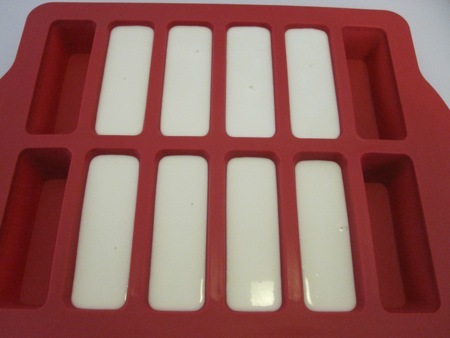 I wrung out the gelatin, stirred it into the cream, and poured the mixture into a silicone mold. It’s made for baking cookie bars,with each well holding two ounces. I could have used ramekins, but I figured they would be difficult to unmold later. I put the mold in the fridge for half an hour to set, then covered it with plastic wrap and moved it to the freezer. Before serving the next evening, I unmolded four of the blocks and set them on a wax-paper lined tray in the fridge to defrost. I made the final garnish – avocado purée – by blending a ripe avocado with a pinch each of salt and sugar, them passing the mixture through a fine sieve. To plate, I smeared about two tablespoons fo the purée across a plate, set the custard on top, leaned a piece of chocolate hazelnut thing against it, and sprinkled caramelized cornflakes over everything. I had a lot of trouble keeping the custard intact as I transferred it from the tray to the plate, managing to slide an icing spatula underneath to support it. Have a closer look at the custard: it has two distinct layers, and the bottom layer is spreading out from its initial shape. Panna cottas are supposed to be soft and creamy, containing the least amount of gelatin necessary to maintain the shape. Adding more gelatin produces hard, rubbery custards that look perfect but taste like pencil erasers. The cereal milk needed more gelatin. After trying a bite I was sure of that. 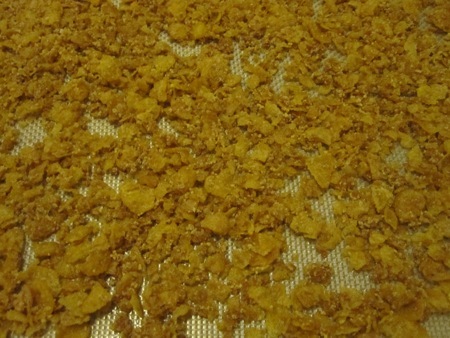 The upper, darker layer was denser and contained all of the cereal particulates, while the bottom layer melted as soon as it hit my tongue. 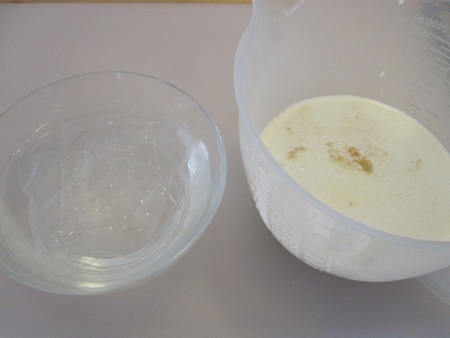 The ideal custard would have had the cereal evenly dispersed, which would have improved both the appearance and the structure. David Chang describes the dish as a transition between the final savory course and the dessert on his menu, a deep fried apple pie. Maybe the salt was meant to assist that transition, but it would clearly need the context of the preceeding and following dishes. She Who Must Be Obeyed, realizing the amount of work I put into the dessert, tried about half of it. He Who Will Not Be Ignored, however, took one bite of the custard, delivered his considered judgment – “Ick” – and ate the chocolate thing before pushing the plate away. If I attempted it again – and I’m not sure I ever will – I would add another sheet of gelatin to the custard, cut the salt down to just a pinch, and sweeten the purée with a bit more sugar. Those changes would let the dish stand on its own as a dessert. Ultimately, Peer Meehan was right: the recipe doesn’t work. Should I ever be in the position to receive more culinary advice from him, I’ll believe it. This entry was posted in food & cooking and tagged cooking, fail, food. Bookmark the permalink.